This has been year of the Serpent – not the Chinese one, but the Essex variety. Since it was published last spring, Sarah Perry’s novel has been flying off the shelves as fast as booksellers have been able to stack them. You could spot the jacket a mile off, and usually you didn’t have to look that far, as the dazzling William Morris-inspired artwork spread like a rash in window displays up and down the country. 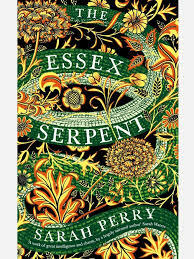 Essex Serpent scooped up prize after prize – Waterstone’s Book of the Year, British Book Award Fiction Book of the Year, Sunday Times Bestseller, shortlisted for the Costa award and longlisted for the Bailey’s – and became flavour of the month for book clubs and reading groups across the country. It is one of those books that even if you haven’t read it, felt like you already must have done. Perry’s novel manages to hit the sweetspot reserved for those rare works of fiction that are both critically acclaimed and wildly popular. Set in 1893, it centres on Cora Seabourne, a woman who, liberated from the crushing constraints of an unhappy marriage by the death of her husband, is discovering – or perhaps rediscovering – the person she really is. Her intense relationship with William Ransome, the vicar of Aldwinter, a village on the edge of the Essex marshes, qualifies the book as a historical romance – but it is so much more than that. Ransome’s parish is in the grip of a nameless fear. Aldwinter is awash with rumour and hearsay of a terrible beast lurking in the estuary. Is it devil-fish sent by Satan himself? A mythical sea-serpent or a collective hallucination? More likely, so Cora hopes, it is an archeological throw-back, a new species waiting to be discovered and named – the scientific find of the century. Cora is a keen amateur naturalist, a latter-day Mary Anning figure, a scientific woman in an age when women were assumed to be, at best, decorative and decorous. Like the botanist Alma Whittaker in Elizabeth Gilbert’s The Signature of All Things, Cora has to fight for the right to think for herself. Those who characterize this novel as a ‘woman’s book’, and highlight only the book’s romantic and the costume-drama aspects, do it a great disservice. The highpoint in the tale for me was not the consummation of Cora and William’s fraught love, but the description of Cora’s friend Luke’s daring open-heart surgery. The writing in this passage is as keen as a scalpel, and as delicate and sure as a surgeon’s hand slicing close to an artery. The book itself is an extraordinarily fine dissection of the human heart, laying out its hidden involutions and recesses as skillfully as Luke does his patient’s. It is not even – or rather, not only – the romantic love between Cora and William that Perry lays bare, but the other loves that are so easily overlooked: a mother’s love for her child; the friendship between Cora and her ‘lady’s companion’ (who is so much more than that) Martha; the love lavished by Cora upon William’s wife, dying of consumption in a kind of obsessive ecstasy of blue; the ties of tongue-tied loyalty and friendship between Luke, the ‘Imp’ as Cora dubs him, and the good-hearted Spencer; and the unrequited passion Luke has for this infuriating, handsome and fiercely intelligent woman. Of all landscapes, the flatlands of southeast England are the least prepossessing. As novelist Jill Dawson puts it: “The Fens. Most people find them – boring. Most people think they’re a bit flat.” Yet perhaps it is precisely the lack of natural drama in the landscape that allows human drama to flourish in literature: W.G. Sebald’s Rings of Saturn, Helen Macdonald’s H is for Hawk, and Graham Swift’s Waterland all come to mind. Jill Dawson’s own fenland odyssey, The Tell-tale Heart, with its organ-transplant theme, explores some of the same medical and metaphysical concerns as well as same physical landscape as The Essex Serpent. There are few greater pleasures in life than curling up on the sofa with a good book. So, my advice is to find yourself a sofa, switch off your phone, and follow the snake’s tail down to the Blackwater estuary where science and poetry call out monsters from the deep.